A trainer works with a dog using FitPAWS equipment. As some of you may know, I got my beloved service dog, Lovey, from Assistance Dogs of the West here in Santa Fe. It was through them that I learned about FitPAWS® equipment and exercises. As a person who relies on a wheelchair, I am always looking for ways to “play” with my service dog. What I love about FitPAWS is that it is not only wonderful for Lovey, helping to keep her fit while having fun, but it is also a really good way for me, or other assistance dog partners, to bond with our dogs and also have fun. I don’t know about you, but just throwing a ball for her to chase in the backyard was getting a little old. This is a whole different method for my dog to build strength, balance, and flexibility. The equipment is not expensive and you can choose different pieces for various exercises. Assistance Dogs of the West dog in training having fun with the FitPAWS activities. We spoke with Jill Felice, Founder and Program Director of Assistance Dogs of the West, about how she uses FitPAWS as part of assistance dog training. 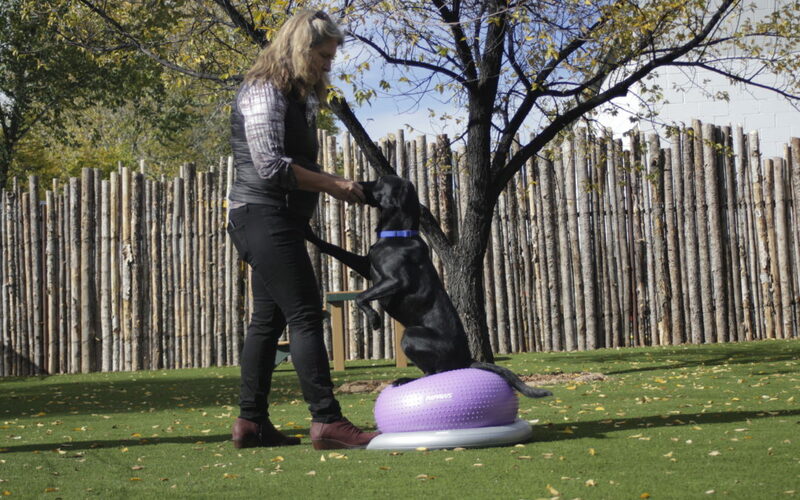 Jill told us that when she took one of the Master Training courses, she realized that FitPAWS would be the perfect way for people who may have a harder time exercising their dog to work on their dog’s flexibility, balance and strength requirements. Jill has seen how the exercises can help build a human-animal partnership. The play component is also a way to strengthen a relationship with your dog in a fast and fun way. Jill shared how she and the other trainers at Assistance Dogs of the West incorporate FitPAWS into placement training with service dogs and their new partners. When the dogs are placed, they’re 18-24 months old, so they’re mature enough and have had their bone structure approved by a veterinarian before they start the exercises. By training the dogs and their partners, FitPAWS can then become part of a regular exercise program to help keep these working dogs at their peak. Assistance Dogs of the West has also started a Canine Fitness Club so everyone in the community can come, learn how to use FitPAWS equipment, and then decide if they want to get their own to use at home. 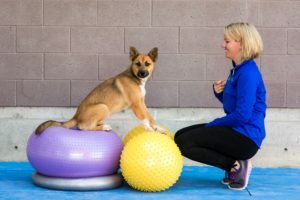 For her private dog training clients, Jill also uses FitPAWS as part of rehabilitation programs. If a dog has had an injury, or has an issue like a weak hind end, they can do these exercises after surgery and/or physical therapy as part of their healing process. Overall, I’ve been very impressed with FitPAWS. It’s fun, it helps me and Lovey bond, and I know it’s a great way for her to stay fit in her role as a service dog, working hard to help me every day. 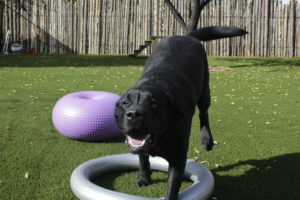 Learn more about FitPAWS at http://fitpawsusa.com/ Or listen to Marcie interview Canine conditioning and fitness experts, Maureen Stevens and Stefanie Walter on the Working Like Dogs radio show, Episode 145. A video from Assistance Dogs of the West of a dog push-up exercise that doesn’t require any equipment.